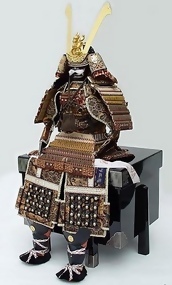 Japanese Boy's Day samurai Yoroi and Kabuto (armor,helmet) set. Musha ningyo (Samurai dolls), Yoroi and Kabuto (helmet), swords, banners and carps are a part of the display used for the Boy's Day in Japan. Culturally, the Japanese emphasize anything to do with children. The Girl's day with hina dolls is in March. The warrior's set like this will inspire boys in their manliness and hopefully bravery, discipline and honor codes come with it. All the fabric used marked as pure silk. Little confusing here (written Gold in this pamphlet) but the metals used are not real gold, it is pressed and molded with a real gold. I scanned the pamphlet that came with this set (enlargement 10). The color of the strings and shoes are different from the actual ones. Assembling takes only five minutes, the whole set can be stored in the black lacquer box (wood), and it is placed in the maker's original paper box. The condition is very good except there are some lacquer chips along the edge of the front and back as shown in the last 2 photos. These would be covered with Yoroi when it is displayed. This is the biggest one that I have now; the height is approx. 3 feet after the assembly. The dimension of the lacquer box are: 16" x 12 1/2" x 13 1/4".